Mother and Father Frog are overwhelmed when their 999 offspring grow up and overcrowd their pond. "We have a situation here," Father intones. When they decide to move, Mother warns them that the world is a dangerous place. Sure enough, they have a long and weary journey ahead of them. They narrowly escape a snake, and when Father is snatched up by a passing hawk, the rest of family comes to the rescue in a surprising way. 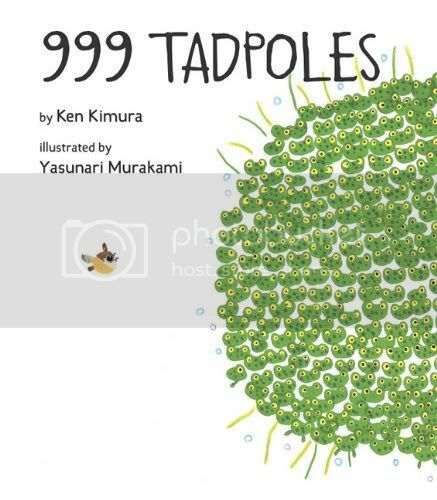 The simple figures, generous use of white space and large eyes of the frogs reminded me of Taro Gomi, not surprising, considering that 999 Tadpoles is also a Japanese import. These illustrations made me think of baby peeper migrations when you'll see thousands of teeny-tiny little frogs hopping all over in late spring. I had expected, in a story with 1001 frogs total, that part of the tale would be about losing some along the way, so I was pleased to see the story end so happily. After the hawk grabs Father, the little frogs each grab hold forming a heavy chain, and the hawk ends up dropping them... into a new pond, with room for them all to make their home there. This is a fun story with a great sense of humor, sure to be a hit at storytime. Oohh... I don't know this book. Now I have to read it. Thanks!